Last Days Review: Fear of the end times? Everyone is asking! The secular press is using the word "ARMAGEDDON" nearly daily. 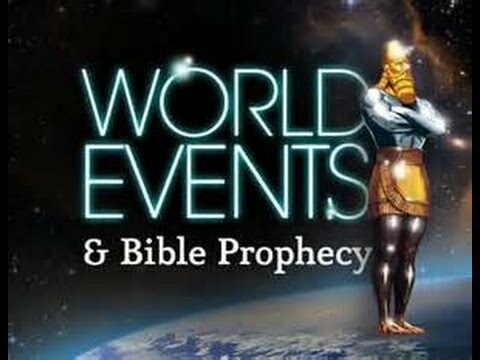 Fear of the end times? Everyone is asking! The secular press is using the word "ARMAGEDDON" nearly daily. It is difficult to keep up with the news these days. Social media is going ballistic. Bad news seems to breed more bad news daily. The big question? Is it finally here? The end times? Will we see the sunrise tomorrow? Is God judging the planet and the countries on it? Look around folks, people are nervous and for very good reason. First let's take these questions in reverse order. I do believe that some Godly judgment is taking place. In fact I wrote a piece talking about that very thing and was about to push the publish button when hurricane Harvey struck Texas. Well I did not think it appropriate to publish an article like that in the teeth of such human suffering from the most costly natural catastrophe to strike the US in recent memory. So, I thought, I will wait a few weeks out of compassion for the victims. While still recovering from Harvey, the nation now faces yet another and even potentially larger threat which is scheduled to strike Florida sometime tomorrow. Hurricane ERMA. Did you know that our current system of hurricane identity only allows for a category 5 ? Erma surpassed the regulations for hurricane activity in the 5 category with initial winds of 185 miles per hour. Since there is no category 6, they simple called a 5 on steroids. Obviously once again I cannot print that article now and guess what? More hurricanes are forming in the wake of Erma. Mexico just got pummeled with a category 8 earthquake, several US states are on fire, Los Angeles county is currently suffering the largest fire in history with 7, 500 acres up in smoke. 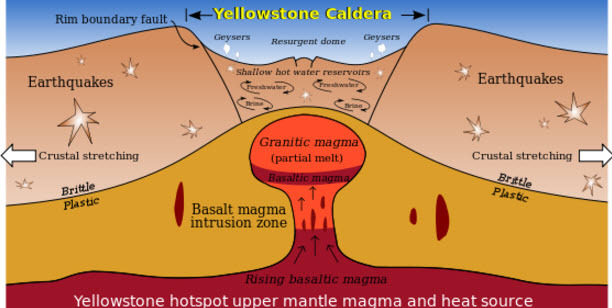 Scientists and even NASA are warning daily that Yellowstone National park could erupt at any moment and devastate the nation. That's right, so here are the facts: The warnings of a devastating disaster from the Yellowstone "SUPERVOLCANO" have been largely ignored by the public. That happens when our scientists seemingly harp on natural disaster. We human beings hear that so much that we have a tendency to think in terms of "cry wolf". But, Yellowstone has produced 878 small quakes in the last month alone. This "swarm" is now the largest ever recorded producing over 2,300 tremors since June. A SUPERVOLCANO is called that because it is thousands of times more powerful than an ordinary volcano (like Mt. St Helens). In 1980 when Mt. St. Helens erupted within 10 minutes, an ash cloud rose 12 miles into the atmosphere and fine ash circled the globe for 15 days. 57 people were killed, nearly 60 bridges destroyed, 200 miles of roadway wiped out, and hundreds of thousands of acres of forest land destroyed. Another, smaller eruption happened in 2008 and the volcano is still active and building pressure once again. Mt. St. Helens was not a SUPERVOLCANO! The predictions for Yellowstone are dire to say the least. Scientists state that the volcano located directly under Yellowstone is 37 miles long, 18 miles wide and ranges from 3 to 7 miles deep. Yahoo News just reported that if Yellowstone erupts it will produce enough power and capability to BURY the states of Wyoming, Montana, Idaho and Colorado under 3 feet of volcanic ash. Rendering the totality of those states uninhabitable. 96% of Yellowstone National Park is located in Wyoming, 3% in Montana and the remaining 1% in Idaho. That one probable future natural catastrophe could bankrupt the USA. It would ground nearly all air travel in the continental United States for some time to come. The emergency resources and FEMA would become overwhelmed within days and volcanic ash would spread over the entire continent and much of the world. I have speculated many times that the reason the United States is no where mention in Biblical end times prophecies may well be the occurrence of the rapture of the church since the United States is home to a declared population of 230 million Christians. But could there also be another reason? Natural disasters are striking the US at an alarming rate including these 2 current huge hurricanes. The US national debt is already approaching 20 TRILLION dollars. Hurricane Harvey may well cost upwards of 190 Billion and Erma is bigger at least in forecast. How much more money can a nation borrow and continue to float it's national stick? When I finally do think it appropriate to publish the ON HOLD article, it may well open the eyes of our administration (as well as Presidents back as far as George H. W. Bush) to rethink the US policy regarding forcing Israel to give up land in exchange for peace. Of course I am not the first to write about this and all before me have been roundly and soundly ignored. In the meantime, lets talk about earthquakes. 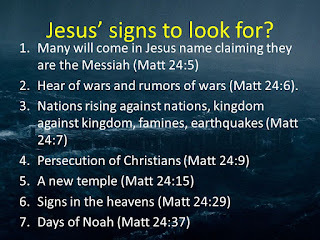 One of those terrible things prophesied by Jesus Himself in Matthew chapter 24. First, the earthquakes of today are measured in two different ways. The Richter Scale we all hear about measures the actual impact of a quake and is Logarithmic in measuring scale. The "Mercalli scale" is used to measure the extent of surface damage. Example; If a young boy has 3 marbles and he finds 3 more he has a total of 6 objects in his hand. Not so with earthquakes. Adding one whole number for example between a magnitude 5 earthquake and a magnitude 6 earthquake actually increases the power by a factor of 10. Each incrementally greater whole number actually increases the event by 31.7 percent. But earthquakes ranging from 7 to 9 on the Richter Scale increases the power output by 100 times. So when it is reported that there was and earthquake off the Mexican coast today that measured 8 on the Richter Scale, it means it was huge. We are still waiting news regarding the surface damage in an area known as Chiapas but it was felt in Cancun, Mexico which is 1,700 miles away from the epicenter. 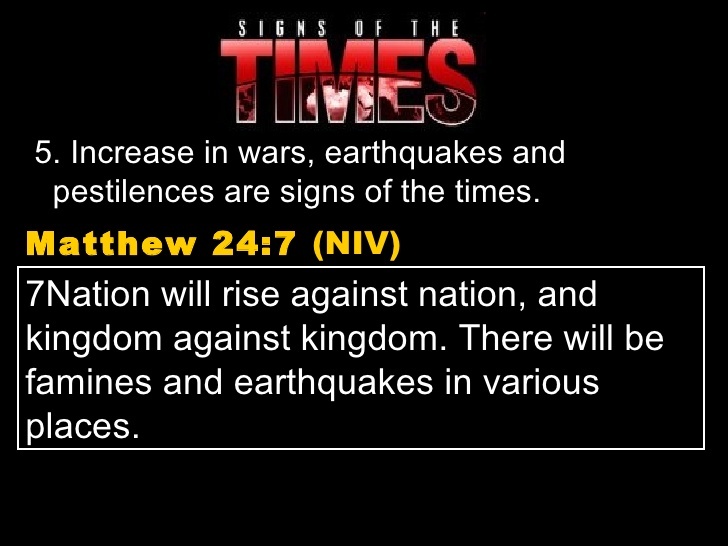 Matthew 24:7 clearly states that in the end times earthquakes will happen in various places. And yes earthquakes have always happened but not to the extent we are seeing today. Of course the USGS (United States Geological Survey) will say it's no big deal---nothing new. What would you expect a Government agency to say to a worried public? FACT: First we do not want to take "snippets" out of the daily news to try and justify Biblical prophecy. On the other hand one would have to be blind, deaf and dumb not to recognize the obvious. Earthquakes have been recorded by various authors and historians all the way back to 856 A.D. Obviously without the aid of modern seismological devices. I have a mountain of research articles however that have impressed me with one conclusion. Earthquakes are indeed on the increase worldwide. Regarding the question "haven't there ALWAYS been earthquakes"? the answer is yes and no. There were no recorded earthquakes in any of the following years; 1961, 1956, 1936, 1924, 1921, 1894, 1893, 1889, 1888, 1883, 1881, 1880, 1878, 1876, 1874, 1870, 1869, 1866, 1858 through 1864, 1844 through 1854, 1839 through 1842, 1837, 1824 through 1834, 1822, 1820, 1813 through 1818. So, the question is simple. Is there any kind of historical trend indicating that earthquakes have either become stronger or more frequent as time has gone by? Well, you be the judge! NOTE: I am only going back to 2010 but a future article will give an update from that point forward. From the year 856 A.D. until 2001 (1145 years) there were a total of 567 earthquakes reported in a magnitude of 6.0 or greater. From 2002 until May of 2010 (8 years) there were 429 earthquakes magnitude 6.0 or greater..
Ummm! Let's see now: 1145 years = total 567 worldwide quakes! 8 years = 429 worldwide quakes!!! Oh, and Pleeeease, for those who may be tempted to make an argument like the USGS does that early earthquakes were not recorded reliably. The information I just gave you dating back to 856 A.D. came off the USGS website. For anyone asking the question "is there concern that we are in the end times"? If you believe what is written in the Bible then clearly the answer is YES! If you want to try and explain that away, it will not change the truth of what is happening all around us. Matthew 24: 4-12 recap; "TAKE HEED THAT NO ONE DECEIVES YOU". 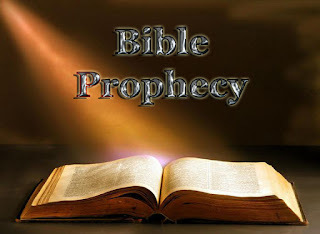 From that point begins a prophecy with "many will come in My name", saying "I am the Christ" and deceive many. We will hear of wars and rumors of wars. Nation will rise against nation. Kingdom against kingdom. 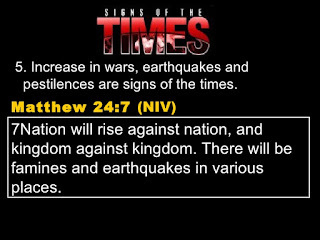 Famines, Pestilence, Earthquakes in various places. Let's begin with wars. 263 wars have been fought in various places and countries since 1900. Currently we still have a minimum of 27 kingdoms on this earth today. Many of them are at odds with one another. In recent years, Sudan fell, Egypt was over thrown, ancient Persia (Iran) under Shah Mohammad Reza Pahlavi fell to the current Iranian religious zealots in 1979. Iraq fell, Afghanistan fell, Libya fell. Lebanon basically over thrown by Hezbollah. It goes on and on and does not even include dozens of countries gobbled up during WWI and WWII. Many countries before that time no longer exist today. 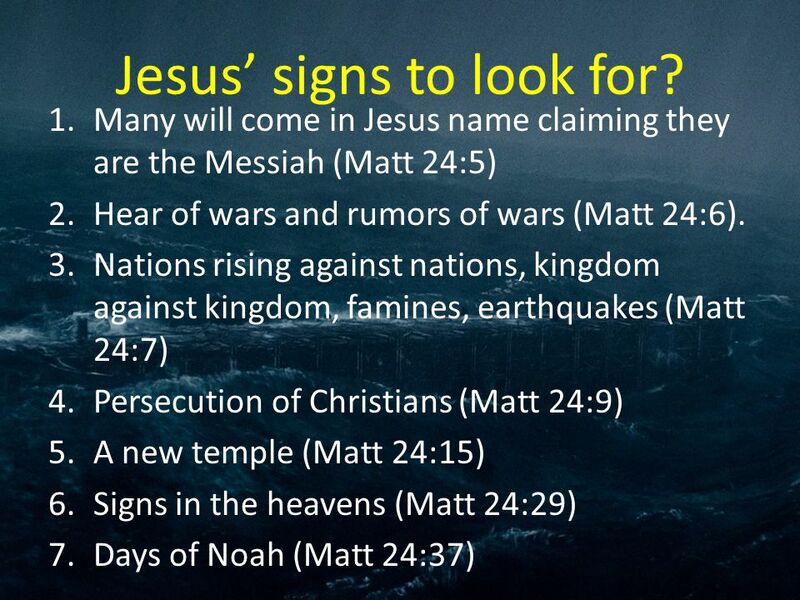 All of this is Biblical prophecy. How about the increase of Pestilence? (Plague). Some forms of these kinds of disease have been reported in Africa, the Congo, Mongolia, Vietnam, India, China, and even in the United States. In Europe of the Middle Ages roughly 25 million people died of plague. Today a minimum of 10 million people in various countries have HIV (aides) with a predicted possibility of 100 million within another 10 years. Aides is in 85 countries. And that is not to mention that many childhood diseases once thought completely wiped out are once again mysteriously appearing. Famines; From 1902 to present, famines have been reported in all of the following countries. India, Spain, China, Lebanon, Germany, Russia, Iran, Rwanda and Burundi, Soviet Union and Ukraine, Morocco, Poland, Greece, Java, Netherlands, Vietnam, Ethiopia, Indonesia, Nigeria, Mauritania, Mali, Chad, Niger, Burkina Faso, Bangladesh, Cambodia, Uganda, Somalia, North Korea, Sudan, Congo, Senegal, Gambia, Yemen, and some could argue the United States during the Great Depression. Now hurricane Erma is barreling down on the US mainland. Who knows what will happen there but it will cost billions no matter what. And how much will a potential war with North Korea cost? Or the protections of allied nations like Japan and others within NATO? What if Russia really does have ulterior motives where Poland is concerned? How will we react and what will it cost if Hezbollah fires an estimated 150,000 rockets and missiles at Israel? What will happen when the brand new dictatorships in both Argentina and Turkey eventually melt down? What will happen if and when Iran's nuclear weapons are finally a reality? When will tensions finally boil over between India and Pakistan and someone decide to pull the nuclear trigger? When will Jihadists finally be strong enough to try and over throw the Kingdoms of Saudi Arabia and Jordan? When will ISIS fully develop it's social media terror organization? None of those questions even approach the potential cost in human life and suffering. Folks, all of these and many many more are on the radar screens as I type this. And in the USA? Are you kidding? The KKK reestablishing itself with other white supremacist groups who hate anyone not white along with all Jews. Black robed and masked people of all colors rushing into peaceful demonstrations with clubs and other kinds of weapons. Police now targeted for assassination. Murder rates through the roof in many American cities. Drugs flowing in from Mexico, suicides on a drastic increase, rapes on college campuses, hate everywhere we look. And you know the saddest thing of all? The church not doing much about it! You say, but what can we do? What do you think would happen if an estimated 230 million American Christians suddenly put politics aside and stood up for Biblical values? What would happen if we all decided to say no to racial hatred, drug gangs, a congress who cannot get along or decide the time of day. What would happen if that "silent majority" stood up with one united voice and said THAT'S ENOUGH! And then what would happen if we acted the part? 2 Chronicles 7:14 "If My people who are called by My name will humble themselves, and pray and seek My face, and turn from their wicked ways, then I will hear from heaven, and will forgive their sin, and heal their land". What sin would that be? All it takes for wicked men to prevail is for good people to do nothing! We are in the end times my friends and there is very good reason to be concerned. 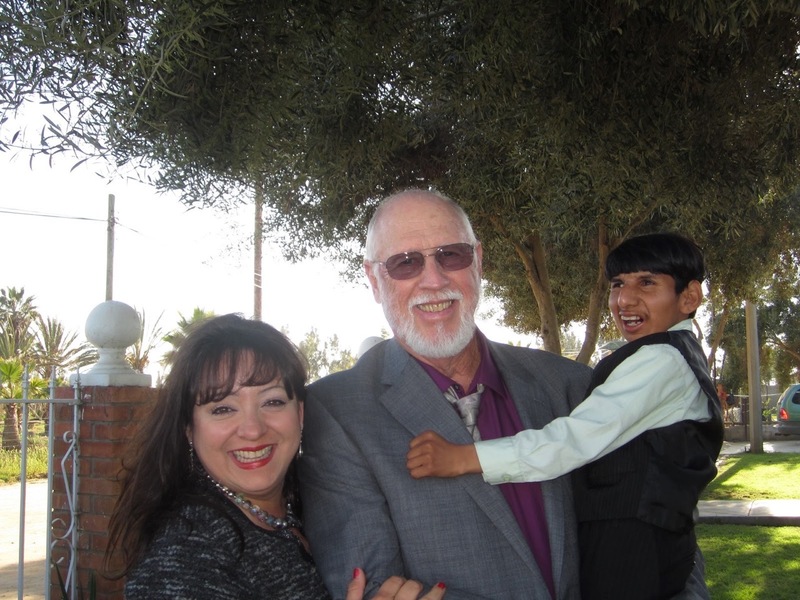 I am trying to do my part by standing up and publishing Biblical articles that can be accessed worldwide. Other Christians are doing the same including pastors, teachers and evangelists. But among those 230 million, we number but a few.